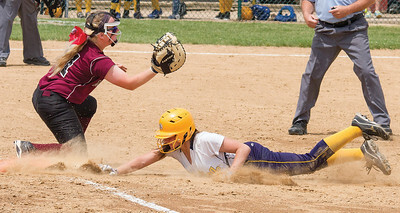 Michael Krabbenhoeft - mkrabbenhoeft@saukvalley.com Marengo's Allison Jasinski gets Sterling's Erin Stroup out at thrid base as she attempts to steal. 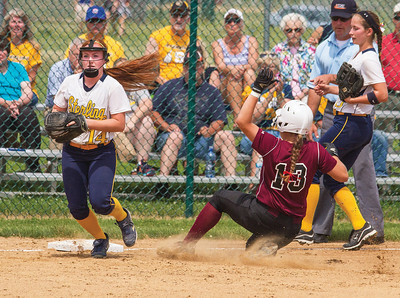 Michael Krabbenhoeft - mkrabbenhoeft@saukvalley.com Marengo's Abby Kissack catches the ball while Sterling's Emily McDonald slides safely back to first base. 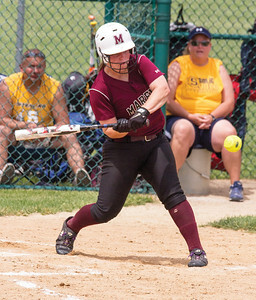 Michael Krabbenhoeft - mkrabbenhoeft@saukvalley.com Marengo's Mariah Dionne hits the ball during Marengo's game against the Sterling Golden Warriors. Michael Krabbenhoeft - mkrabbenhoeft@saukvalley.com Sterling's Darien Bardoner (left) catches the ball and makes the out as Maregno's Taylor Carlson slides into third base. 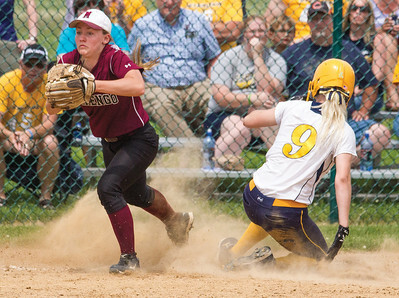 Marengo's Abby Kissack catches the ball while Sterling's Emily McDonald slides safely back to first base.